What is EMDR for CRPS and chronic pain? How can it help you with your pain and other symptoms? These are questions that will be answered in this blog article on Eye Movement Desensitisation and Reprocessing or EMDR. 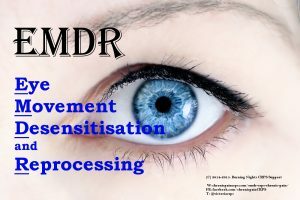 EMDR is short for Eye Movement Desensitisation and Reprocessing and is used as a psychological treatment for various conditions including CRPS and chronic pain. It is classed as a fairly new form of psychotherapy and it is often used as a treatment for Post Traumatic Stress Disorder (PTSD). 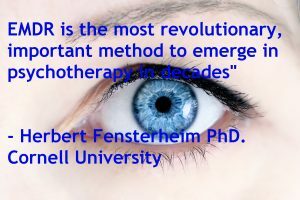 There is some research available for EMDR as a treatment for CRPS or chronic pain but the treatment is treated as controversial. WHAT IS EMDR for CRPS & CHRONIC PAIN? HOW DOES EMDR HELP & WORK for CRPS or CHRONIC PAIN? WHAT HAPPENS DURING SESSIONS of EMDR? The first couple of session are for taking your history and organising a treatment plan. It is in these first few sessions that your therapist will identify any memories, events, feelings or disturbing issues that will used as the focus for the EMDR treatment. The initial EMDR processing will usually focus on any childhood events rather than adult ones. Length of treatment depends on the number of traumas and the age of the onset of PTSD, start of CRPS or chronic pain. Before you begin EMDR for the first time, the therapist will ask you to find what is known as a ‘safe place.’ This can be a memory or an image that makes you feel comfortable and positive, such as a moonlight beach, sun setting… If a session does not fully complete or if you have a very distressing and upsetting EMDR session, your therapist will take you back to your ‘safe place.’ Your therapist will also help give you other ways of dealing with your emotional distress by using stress reduction techniques and imagery that you are able to use both during the sessions and between them. Your therapist will then ask you to simultaneously focus on the image, your negative belief and the disturbing emotion or any body sensations. You will then be asked to follow with your eyes the therapists’ finger or object which will move from side to side, back and forth or diagonally. After each set of around 20 eye movements, you will be asked to tell your therapist what has come up, which could be a physical sensation, a feeling, a thought, memory, image, any or no changes. There is no right or wrong in this. Then your therapist will ask you to do the same as before but this time to focus on the image that has just come up. Occasionally your therapist will tell you to think back to the original target image or on another image, feeling, thought, memory or physical sensation. Every so often you may be asked as to how much distress you are feeling. The Desensitisation phase will end when what is known as SUDS or Subjective Units of Disturbance Scale has reached either 0 or 1. This stage is known as the Installation Phase and it is when you are asked about the positive belief that you would use instead of the negative belief of yourself or the image. Just like in Phase 4 you” concentrate on the image in your head and watch your therapists fingers. The idea behind this phase is so that you can strengthen the positive belief that you have said such as “I can do this” or “I will overcome the pain.” After each set of eye movements you will be asked to rate your Validity of Cognition (VOC) or the truth of your belief on a scale of between 1-7. When you have reached level 7 and accepted this positive belief then the installation phase is complete. This is classed as the Body Scan phase. Once you have your positive belief in your mind, in this phase your therapist will ask you if you have anywhere in your body that is painful, any discomfort or stressful. If you have, you tell your therapist and you are then asked to concentrate on that pain, discomfort or stress and your therapist will start the sets of finger movements, tapping or bilateral sounds. This phase is complete and successful when you are able to think about the original problem or event without feeling any bodily pain, stress or discomfort. This is the closure or debriefing stage in the 8 phase treatment. 1 of the main goals of EMDR therapy is that you leave better than when you arrived. You won’t always be able to finish completely at the end of each session, so your therapist will give you some self control techniques to work through between the sessions. Your therapist will also give you information as to what you may experience in between the EMDR sessions such as disturbing images, flashbacks, painful emotions. If or when these happen write them down in a diary to keep and show your therapist at your next EMDR session. It may give your therapist a new target for another session or help your therapist understand whether the EMDR is helping you with your targets. The final phase is the Re-Evaluation phase. When you start each EMDR session, you will review the past week telling your therapist any new sensations. You will also review any targets that have already been processed. Your therapist is hoping that your positive belief has been maintained. Depending on what happens during the re-evaluation your therapist will decide on whether to start on a new target or to revisit an old target for more processing. An objective of this phase is to ensure that historical events have been processed. Details for the 8 phases from the following sources: Bartson, S & Smith, M. (2011) Menon, S. & Jayan, C. (2010) Sweeney, P.
Hopefully our article on EMDR for CRPS & Chronic Pain has helped you understand another psychological treatment available in most countries worldwide for the symptoms of CRPS/RSD and of any other chronic pain condition. Would you try EMDR therapy for your Chronic Pain or CRPS? Let us know your thoughts! Why not share this blog on social media? P.S. 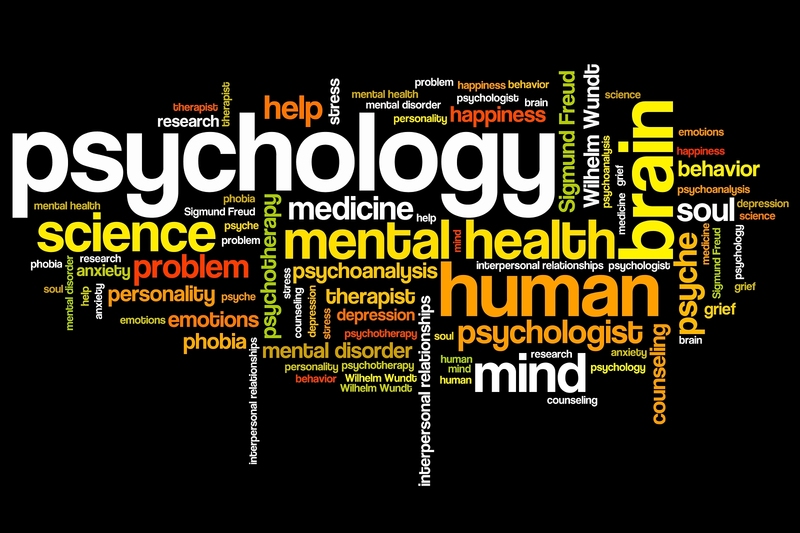 Have you checked out our other psychological treatment blogs? Why not take a look at our psychological treatment article series? This was interesting, and I hope it will help many people. Has there been success with those who had no traumatic event (either the 33% with no known trigger, or those with something like a surgical procedure as the trigger)? Thanks so much! Thank you for your comments!EMDR is supposed to help anyone who has sufferers a traumatic event in their life which includes being told that you have a diagnosis of CRPS. It doesn’t necessarily have to come from any particular incident or cause, but the diagnosis itself and being told there’s no cure or you have the condition or chronic pain for life is enough to be seen as a trauma in your life. We will have a look for success rates and see if we can find any rates for NOS CRPS and for CRPA from a surgical procedure. But EMDR is for coping with chronic pain, not being able to do the things you used to do etc. as well. Just read your latest blog and this is something I def want to try to help me learn to cope with this condition. It seems a complicated phase system but hopefully it will work and I can start to relax when I talk about having crps!